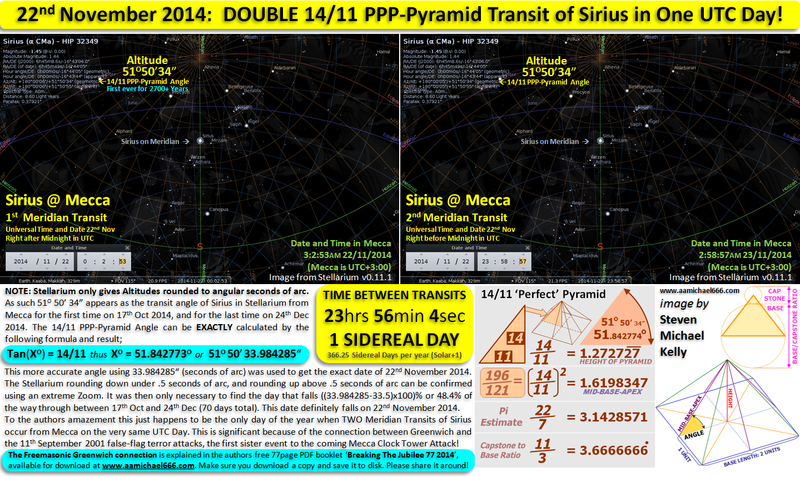 ABOVE: A virtual sky view of the double transit of Sirius from the Kaaba, Mecca, on 22nd November 2014, both occurring in the same UTC Date of 22nd Nov. Also a brief explanation of how this date was singled out as being significant to this location using a special PPP-Pyramid Angle known as the 14/11 or Perfect Pyramid. 22/11/2014 is the primary date encoded in the Georgia Guidestones 666-Cube, that was ritually smashed on 25th September 2014 (The Jewish New Year). The connection between Sirius, 22/11, and the coming Mecca Clock Tower ritual sacrifice which is most probably planned for 11th January 2015, is key to understanding how the secret occult controllers of the western world, are planning to transform the world into a new Empire under their control.